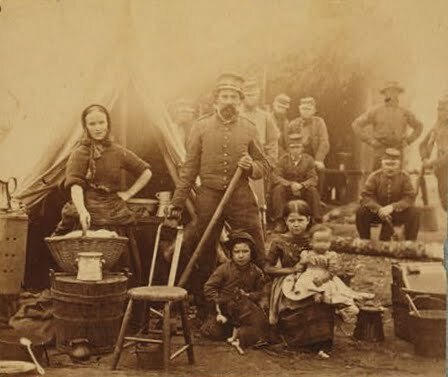 A soldier's family in camp, allegedly with the 2nd Pennsylvania Reserves. In reading wartime newspapers and soldiers' letters to their wives, something that has stood out to me is the very precarious existence that many poor and working class soldiers' families often faced. It appears that many soldiers' going off to war put their families at risk not just financially, but also in terms of basic physical needs (e.g., food, medical care, fuel for winter). I don't know how soldiers' army pay compared to that of their prewar occupation, but delays in receiving pay and logistical barriers to sending pay home certainly made things difficult. Support from informal familial and social networks. Lewis Jones' letters reveal a somewhat strong network among the South Queen Street families and their soldiers in the 79th Pennsylvania. When Jones' friend and wife's brother-in-law died of disease in early 1862, Joseph also tried to help the Maxwell family in many ways, including one note from an 6/25/1862 letter, "Give Josephine [Maxwell] a dollar to buy som things for her childern for the forth of July." The city's professional class also occasionally worked pro bono on behalf of needy soldiers' families, and one doctor's alleged indifference toward the Maxwells became part of a libelous campaign against the doctor when he ran for mayor in 1862 (another story for a couple months down the road). Support from institutions, private and public. Religiously-oriented aid groups, such as the Union Dorcas Society, had already existed in Lancaster before the war and easily extended their mission to meet the needs of soldiers' families. The Mennonites, whose wealth (as a group) and pacifism sometimes made them targets of scorn among the war's supporters, appear to have contributed prominently to aid efforts for soldiers' families. Finally, as the article below indicates, the Lancaster County Commissioners also arranged for public sources of aid for soldiers' families, but I don't know too much about how public aid worked, so I'll be likely to revisit this topic as I learn more about it in the future. From the August 27, 1861, Daily Evening Express: (alternate link), it's apparent that some soldiers' families faced hardships even before the regiment left Lancaster. Read on further in the column for an appeal (with some humor) to ladies to knit stockings for soldiers.